The design of external index structures for one- and multidimensional extended objects is a long and well studied subject in basic database research. Today, more and more commercial applications rely on spatial datatypes and require a robust and seamless integration of appropriate access methods into reliable database servers. 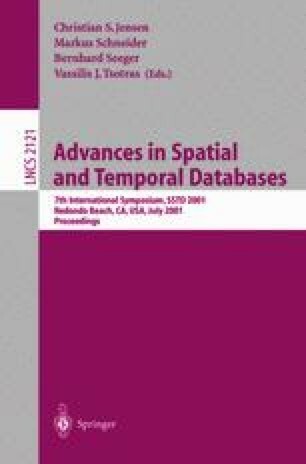 This paper proposes an efficient, dynamic and scalable approach to manage one-dimensional interval sequences within off-the-shelf object-relational database systems. The presented technique perfectly fits to the concept of space-filling curves and, thus, generalizes to spatially extended objects in multidimensional data spaces. Based on the Relational Interval Tree, the method is easily embedded in modern extensible indexing frameworks and significantly outmatches Linear Quadtrees and Relational R-trees with respect to usability, concurrency, and performance. As demonstrated by our experimental evaluation on an Oracle server with real GIS and CAD data, the competing methods are outperformed by factors of up to 4.6 (Linear Quadtree) and 58.3 (Relational R-tree) for query response time.